Forget about root admin and bypass root account by using your current user account, but with the admin interface. Then set up DSL connection instead of VDSL and you’re good to go. The bypass process is not complicated and takes about 10 minutes to complete, a general cmd line skills are required. If you run into troubles, hit me up (e-mail). navigate yourself to Management>Device Management>”Backup and restore settings” and download config file. Place the file into the same directory like a script from step 5.
run terminal/cmd line and navigate to a folder where you have a decryption script (hg635_configtool.py) as well as downloadconfigfile.conf (downloaded in the previous step). Edit file output.xml, find a line starting with <UserInfoInstance InstanceID=”2″ Username=”admin” … and edit parametr Userlevel=”1″ to Userlevel=”2″. Save and exit. Upload output.conf to a router via internet browser -> router administration -> “Maintain > Device Management > Backup or Restore Settings > Restore Settings > output.conf“. Use the hack from step 2 to see the menu. Once done, re-login to your router as normal. Internet->Internet Settings->new WAN connection and fill your details. Once done, hit apply. Connect your DSL cable and hit restart PPPoE, wait 2 minutes and see if you’re connected. 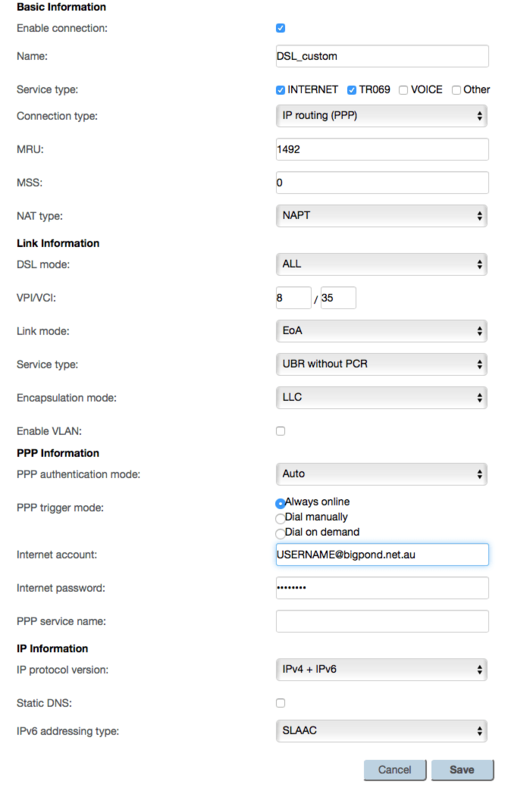 Below is a screenshot of settings for Telstra / Bigpond broadband if that helps. Don’t forget to replace “USERNAME” with your username;). Happy surfing.